The Jetech model HE-30/40 heat exchanger cleaning system is engineered to clean and unclog heat exchanger tubes and pipe in a semi-automated process. After initial setup, the system requires only one operator who can control the rotation of the lances and the in/out motion of the lances for cleaning from the remote operator’s station. Standard unit has one rotating lance. Optional: 2, 3, or 4 rotating lances. Remote operation station with foot control valve and joystick in/out control of the lances. Effective cleaning length: 25 feet (7.68 m). 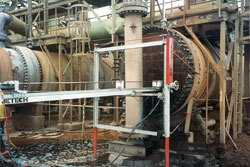 Box style X-Y frame with attachment points to heat exchanger. Swing type level unit at rear at system to control level position of the lance track unit. Alum. Linear track system with slide carriage. One 953RS Eddy-Jet seal per lance.